How do I find a book published by a university press? - Ask Us! Q. How do I find a book published by a university press? There are a couple of ways to find books published by a university press. You can use JEWL Search, located on the Library home page or search the Library Catalog. Directions for each are listed below. Using the JEWL search box. 1. Enter your search term(s). i.e. police brutality. 3. On the results page, choose Books from Refine Results: Source Types. 3. Click on Publisher and select one associated with an eduational institution i.e. "university of minnesota"
The results will update with only titles from the publisher selected. 1. Click on the Library Catalog link from the Library home page. Then choose Advanced Search. 2. Enter your keywords / search terms in the first box. 3. 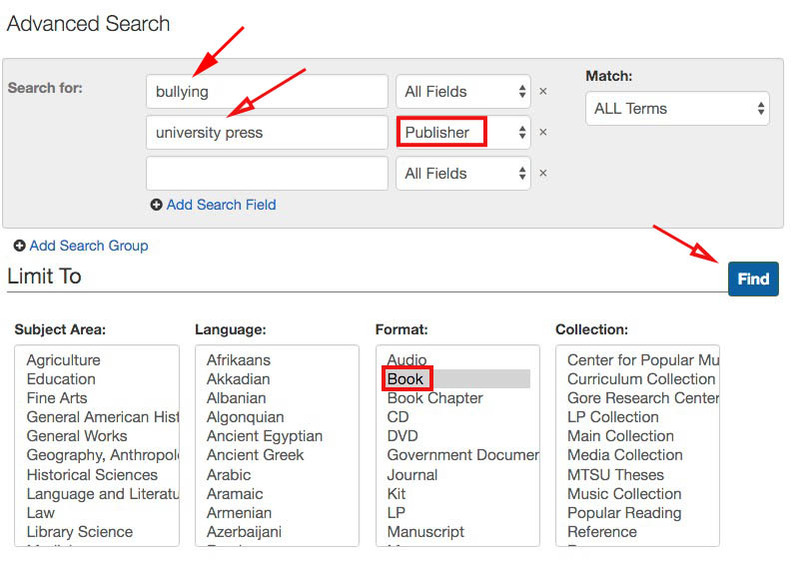 In the second box, type "university press" and select Publisher from the All Fields box. 4. From the Format box select "Book". 5. Click on Find to run the search.